Buying a toaster is more complex than it seems. Alphachooser takes the guesswork out of the equation by listing toasters by categories that go far beyond the usual "two slices or four" approach. There are faster toasters, auto-lift ones and motorized models for you to choose from. According to our multi-review-based ranking system, the best toaster 2019 should be the KitchenAid Pro Line 2-Slice, and the second best toaster 2019 is the HoLife 2-Slice. 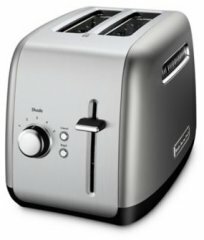 Here is the full top 10 list, then sub-categories and a complete list of toaster brands and models. Considering this toaster's aggregate rank of 92%, we are confident that the KitchenAid Pro Line 2-Slice is currently Alphachooser's best toaster 2019. Furthermore, we think that our 68 reviews sampled from our sources give us a high confidence level (more on confidence levels) that justifies making it a "no-brainer best choice." 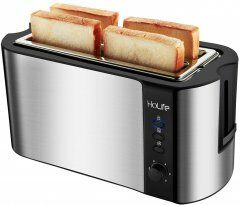 With its star rating of 4.5 computed from 82 reviews, we rank this HoLife model second best toaster. * This list, by the way, is based on an in-depth analysis of hundreds of toaster reviews from multiple sources. Our illustration: The Hamilton Beach 24910. Our illustration: The Black and Decker TR4310FBD. All Black and Decker toasters. Our illustration: The Cuisinart CPT-2400. Our illustration: The Oster TSSTTRGM2L. Our illustration: The Waring WCT855. Our illustration: The Proctor Silex 22215. Our illustration: The KitchenAid KMT4116. Our illustration: The Breville VTT686. Our illustration: The Dualit Studio 4-Slot. Our illustration: The T-Fal Avante Icon 4-slice. 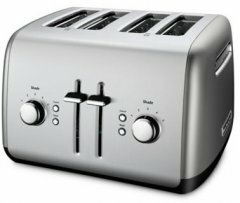 Basic 1800-watt toaster with two special handles for toast lift. Our illustration: The Krups Savoy KH3110. Our illustration: The Russell Hobbs TR9250RDR. Our illustration: The Maxi-Matic ECT-4829. Our illustration: The Brentwood TS260W. Our illustration: The Bella BLA14466. Our illustration: The West Bend 78823 2-Slice. Our illustration: The Hatco TK-72. Our illustration: The Sunbeam TSSBTR2SLB. Our illustration: The Aicok VTT431. Our illustration: The Toastmaster TM-43TS. Our illustration: The Pangea Brands Death Star. Our illustration: The Nostalgia Grilled Cheese Sandwich. Our illustration: The Kenmore 133109. Our illustration: The Chefman RJ31-P2. Our illustration: The Calphalon 1832632. Our illustration: The Betty Crocker BC-1618C. Our illustration: The westinghouse wt44ba select 4-slice. Our illustration: The Bonsaii T869. Our illustration: The Cusimax CMST-T85. Our illustration: The Professional Series PS77451. Our illustration: The Gourmia GBF370. Our illustration: The Fortune Candy Stainless 2-Slice. Our illustration: The Keemo KM001. Our illustration: The Salton ET1403. Our illustration: The Smeg TSF02BLUS. Our illustration: The Wolf Gourmet WGTR102S. Our illustration: The OXO On Motorized 2-slice. Our illustration: The Disney Mickey DCM-21. Our illustration: The Nesco T1600. Our illustration: The Hauswirt HT10. Our illustration: The Dash Go Easy. Our illustration: The Limee TR0701. Our illustration: The Bonsenkitchen TR8741. Our illustration: The BREVO T2300NU. Our illustration: The Willsence Intelligent TA-S1. Our illustration: The HoLife 4-Slice. Stainless steel 2-slice designer toaster with a bun warmer and a minimalist look. 300-slices/hour conveyor toaster with an air circulation cool-touch system and a 2-year warranty. 4-slice, multifunction toaster that can toast and cook eggs simultaneously. Designer toaster with a slice-selection button (1 or 2 slices) and a protective cover. 900-watt designer toaster available in White, Black, Red or Lime. Stylish stainless steel (even the interior!) 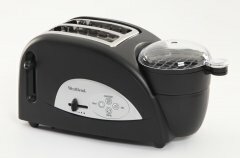 850-watt toaster with LED indicators concealed under transparent glass sides. 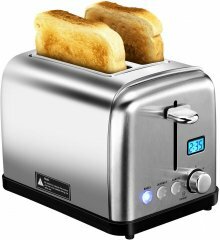 A motorized toaster with a LED display for the browning level and not much to brag about other than its unusual stylish stainless steel appearance. 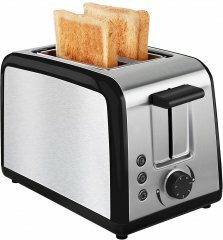 A budget toaster with only siz browning settings and not much to brag about other than the stylish dual-tone stainless steel exterior. 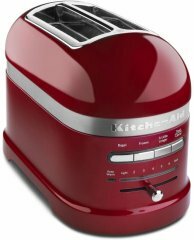 A toaster boasting a wide range of vibrant color options, but with less functions than you would expect in a even a basic toaster. 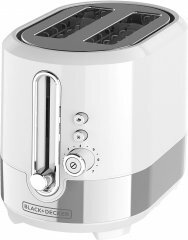 Stylish modern stainless steel basic 2-slice toaster featuring centrally located controls and 1.26-inch wide slots. 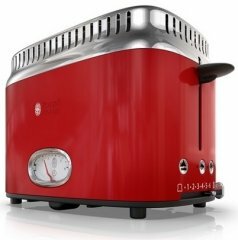 An extremely minimalistic toaster capable of handling only one slice of bread, but with 500 watts of power. 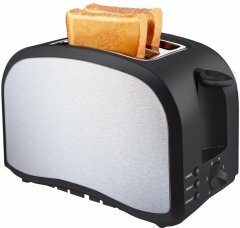 A basic toaster with a silicone cover and not much features to boast about except for its chubby black or white design with big buttons. Long-slot German toaster with an integrated bun warmer and a reheat function.